An average of 67.75% of all online shopping carts are abandoned according to Baymard Institute, an independent web research company. Think about that for a second, for all of the work you’ve spent optimizing landing pages, pricing strategies, and perfecting your information architecture, just about 7 out of every 10 people are going to stop at the finish line. How depressing. What’s worse is that number, 67.75% is an average of 21 different studies on cart abandonment, taken over the last 8 years. In Q1 2013 the average shopping cart, basket and booking abandonment rate among top 200 retailers was 73.6% (up from 70.7% in Q4 2012). Worse than that, a study by SeeWhy reports that 99% of visitors won’t buy on their first visit. The truth is, from $1.2 Billion lost in 2009, to $9 Billion in 2011, the amount of money lost due to cart abandonment has been climbing rapidly over the last few years. According to Forrester Research, the estimated total of annual abandoned shopping cart revenue will reach $31 Billion dollars. So let’s talk about why cart abandonment happens, how to recover abandoned carts, and explore some winning strategies that have worked for others. When you’re looking at all of the abandoned orders, it’s easy to imagine that customers leave their shopping carts simply because they changed their mind at the last minute. But digging in, you find that’s simply not the case. In fact, most research indicates that the #1 reason people abandon their carts is “unexpected costs” like shipping, taxes & fees. Seeing as the top 4 reasons people abandon their cart have to do with “Price” and “Timing”, we’ll explore those 4 reasons in depth , and discuss different strategies & how to combat it. Imagine you’ve just spent the last hour at the grocery store picking up items for a summer barbecue. You’ve taken care to pick the perfect meats, sides and beverages for your guests, and though you’re operating on a budget, you’ve managed to come in just slightly under budget. When you approach the checkout the clerk announces your total, followed by taxes, a “bagging fee”, “card processing fee”, and a “packaging fee”. Do you continue your purchase, or would you try another grocery store without as many hidden fees? Online, of course the “unexpected costs” commonly takes form of shipping costs. Turns out, bigger companies have spoiled your customers, and if you don’t have some form of “free shipping” offer, you’re increasing the risk of cart abandonment. 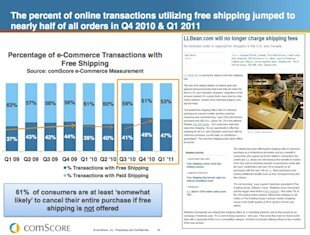 Back in 2011, comScore reported nearly half of all online online purchases had some sort of “free shipping” offer. That same 2011 report noted that 61% of consumers said they are “somewhat likely” to cancel their order if free shipping is not offered. “Free shipping” becomes even more important when you learn that “Free Shipping Week” -started in 2012- increased online spending by 16% during the period of November 1st to December 21st with significant lifts (up to 53%!) on major shopping holidays. According to Deloitte, 20% of consumers believe “free shipping” is top reason to shop with a particular retailer. Turns out, “Free shipping” is a huge factor in online customer experience. Still think “Free Shipping” isn’t something your business can do? This article on Web Marketing Today gives some really great advice on how to tackle the free shipping conversation realistically. Perhaps my favorite advice is consider your order thresholds, if your average order is $50, offer free shipping for $60 orders. Also, one of the many findings in a joint study by Harris Interactive & UPS was that 39% of customers reported they’ll often purchase enough to get free shipping when available. In this talk by Tony Hsish, CEO of Zappos, states the bulk of their marketing budget is spent not on inbound marketing, but on customer experience, mainly on surprise free overnight shipping. Hsish says they’re operating under the theory that people aren’t shopping with Zappos based on price, but rather on a superior customer experience, which ultimately leads to strong word of mouth marketing. Bonus Case Study: In this case study, Western-ware retailer, Shepler’s increases top line sales by 57% in underperforming markets by offering free shipping. Repeat after me… cart abandonment is a part of the buying cycle. In an extensive study from SeeWhy, they analyzed the behavior of over 600,000 people and a quarter of a million online transactions to further understand an online shopper’s motivation for buying and more importantly, when they don’t. In a sharp contrast, 81% of online merchants believe that the majority of abandoners are simply wasting the merchant’s time. 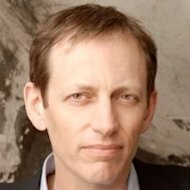 This miscommunication of intention leads to serious missed opportunities, especially when merchant believes cart abandoner’s aren’t worth marketing dollars. According to the study, the average time delay between first visit and purchase is 19 hours, but 72% of visitors will buy within the first 12-24 hours. Seeing that 75% of visitors actually have intent to buy, it’s critical to get email remarketing & search remarketing triggered almost immediately after the cart gets abandoned. Assuming a good portion of visitors are abandoning the cart because they’re looking for better shipping or better deals, you want to be as present as possible while they continue their search. Shopping Cart Abandonment: Why It Happens & How To Recover Baskets Of Money“You’re going to want to play with things like recency (how quickly you serve up an ad so someone who was on your site) and frequency (how often you serve the same ad to the same person) to find the sweet spot between super annoying (for the recipient) and not noticeable enough. All of this matters, because as it turns out, the study shows that the more a person abandons the same cart & the more they return your site, the more likely they are to convert. At first glance, this is pretty straightforward logic as to why someone would abandon. According to a different study by Forrester it’s confirmed that ”price & timing” are the major themes as to why shoppers abandon their carts. But in order to really understand how price plays a role in cart abandonment, you have to also understand that not all cart values are created equal. Going back to the study by SeeWhy, we discover that low carts tend to have a higher abandonment rate. My instinct says this is likely due to lower priced carts contain higher amounts of commodity goods, so searchers abandon specifically to find a better price elsewhere. Operating under the assumption that abandoners are intentionally leaving to find better prices, and understanding you’re probably not willing to race to the bottom on price, here are a few retargeting communication strategies you can use to recover the lower priced carts. 1. Use Retargeting to Emphasize “Free Shipping” & Other Customer Satisfaction Perks. “Free Shipping” “Live Support” or “Free Return Shipping” are all huge selling points, and could become the deciding factor for lower cost cart abandoners. Harris Interactive has found that 56% of customers would be willing to switch brands based on better customer service options. Using a service like Retargeter, you could run a campaign that leverages banner ads, video, and sidebar advertising, that highlight your customer satisfaction policies. So if a cart abandoner leaves your site to watch a product video on Youtube, or searches a product review on a different blog, you’d be right there giving clearly demonstrating why your site is the best choice. Remember that Zappos video from earlier? Tony Hsish credits their focus on Customer Satisfaction to be the reason they’ve generated over $1 Billion dollars in sales, even though they’re primarily a shoe company. This article on Guildquality demonstrates just how deep Zappos focus on customer satisfaction really goes. This is fairly common for the brick & mortar retail stores, and E-commerce is just starting to catch on. Target comes to mind where you get 5% off your first (and every) purchase + Free Shipping simply for being a RedCard member. According to Forrester Research, loyalty program members also spend an average of up to 13% more and increase shopper annual visits up to 20%. If a low price cart abandoner starts searching for a bargain, but instead finds a quick win and repeat value through your loyalty program, you’re greatly improving your chances for repeat purchases in the future. Going back to the SeeWhy data, we also learn that 11% of returning visitors who have made a purchase (within the previous 28 days) will make additional purchases, making a very strong case for offering a loyalty program up front. Not specific to “low cost” cart abandonment, the creative for this retargeting tactic should be adapted for carts at various price points. In a study by Harris Interactive, it’s stated that 53% of online shoppers cite a lack of human interaction as a reason for abandoning the shopping cart. The same study reports that 86% of consumers want more ways to interact with a brand. By combining call tracking, display ad retargeting & click-to-call advertising, you could create a retargeting campaign that uses a call tracking solution to advertise over the phone ordering/sales support on the sites your visitor goes to after they abandon their cart. Imagine how convenient it would be to call in your Amazon basket the same way you’d order a pizza. For higher priced carts, retargeted ads would use a specialized call tracking number which routes to a specialist who answers questions about products and make recommendations & upsells related to the items in abandoned basket. The idea here is to decouple phone support from your website, and use it as another option for buying. Considering that 71% of customers are concerned about businesses having their credit card information, making live human contact a primary selling point can go a long way in building trust. Bonus Case Study: Though I wasn’t able to find a case study that directly uses this method, I did find a facinating study that Forrester Consulting conducted by creating a composite company (3 retailers and 3 airlines) which used Click-to-call/click to chat solutions to resolve product, billing, and purchasing issues in real time. On site, this improved sales by 23%. Considering that call tracking & ppc retargeting have been proven to increase leads & sales in unlikely categories, I’m confident combining these tactics would produce a positive ROI. So far, we’ve talked a lot about ad retargeting, but what role can good ole recovery email play in getting visitors to complete their transaction? Back in 2011, SeeWhy reported that only 16% of online merchants sent shopping cart abandonment emails, which is surprising because statistics also show that cart abandoners will spend 55% more. 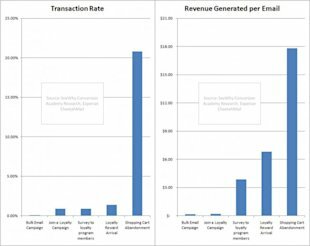 It’s also noted that the transaction rates and revenue generated through email retargeting is significantly higher than other email marketing programs. Images – Including images of abandoned items, reviews & recommended products as well as a single call to action drive visitors back to the cart. Phone Number – Featuring your phone number in a focused environment (like email) can diffuse any concerns your customer may have. It’s also critical to have the technology in place to track & route phone calls coming from recovery emails to properly measure conversion rates. Customer Satisfaction Reminders - Satisfaction guarantees, return policies, shipping policies, and any other perks you offer to make your customers happy should be made known. In this brilliant triggered email case study, Horse supply company SmartPak Equine hits all the right notes. They send abandoned cart email one day after a cart has been abandoned. The email includes the names and images of the abandoned items, as well as prices, ratings & a link to return to the cart. Also included are reminders of the company’s “100% happiness guarantee”, free shipping over $75, free return shipping, and price-match program. According to the study, the campaign earns an average of $4.80 per email, and a 50% conversion among readers who click through. 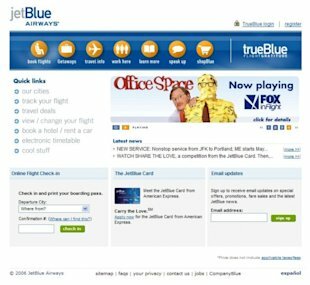 Another case study by Jetblue shows how the company uses a much softer approach in their email retargeting, and how they contemplated just how much personalization data to include in their recovery emails. Finding the right balance for the airline resulted in 150% higher open rates and 200% higher conversion rates than standard promotional emails (resulting in 1,640% increase in revenue). While there is no “one size fits all” approach, it’s worth considering taking the recovery email a step further, and turning it into a full sequence. In the email retargeting article, we mentioned SmileyCookie.com and how they used a triggered sequence to recover lost carts. Offers a helpful customer service tone, subject line asks “Oops…was there a problem checking out?” Also includes ordering F.A.Qs, Customer Service Phone number, 100% satisfaction guarentee, single call to action. There is also a large graphic displaying the offer, with a coupon code that is hyperlinked to the customer’s abandoned cart. It’s important to note there are no customer service links in this email. Instead there are three links encouraging customers to complete their purchase. It must be noted: Offering discounts is not recommended as a part of the recovery strategy, as you do not want to condition your customers to expect it. The important take-away from using the framework is that it corresponds directly with the “time-to-purchase” graph found under the “I was just browsing” section. As always, frequency and recency is something that should always be tested to find the best fit for you. If you’ve made it this far, you’re probably wondering what tools you would need in order to get everything in order. SeeWhy’s Core – Full featured solution, integrates with over 30 different services. Enterprise level cost. Rejoiner – Real time abandoned shopping cart recovery tools for online retailers. SalesCycle – Automatically recontact abandoners via email, sms or call centre. Vero – Send emails to your customers based on their actions – like abandoning cart. AbandonAid – Cart abandonment tool. CartRescuer – new kid in the block. 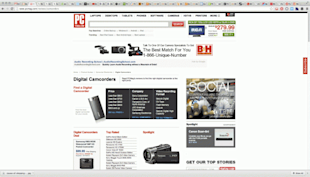 + various ecommerce platforms have their own extensions you can use. For call tracking tools see our call tracking post. If there’s anything you should take away from this article, it’s that abandoned carts are a huge opportunity to re-engage with would be customers to create a real, meaningful long term relationships with your visitors. An abandoned cart is a great (if not the best) starting place to really demonstrate your core values because the cart abandoner has already spent their time interacting with your site and putting an order together. By using smart ad/email retargeting & call tracking to communicate what makes your company unique, you can encourage repeat purchases, and if you’re taking a page out of the Zappos playbook, that coveted word of mouth marketing.